NEW ARRIVAL AT CAPITOL RENEGADE. WITH A TOTAL OVERALL LENGTH OF 30'. 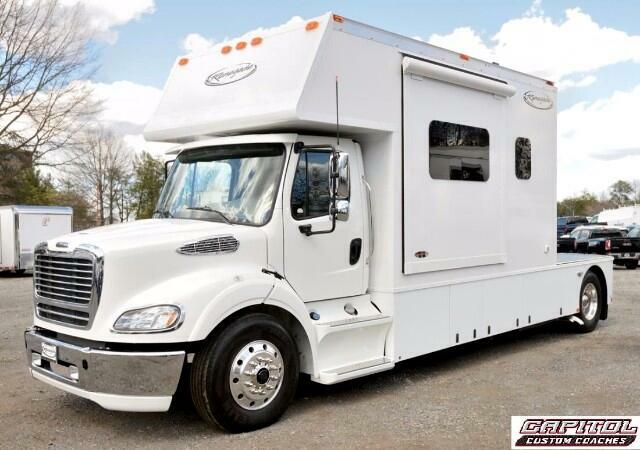 WE BUILT THIS TOTER FOR EXTREME MANEUVERABILITY, INTERIOR COMFORT, AND PLENTY OF HP FOR ALL YOUR NEEDS. FREIGHTLINER M2-112 CAB AT 470HP WITH A FULLY AUTOMATIC 6-SPEED ALLISON TRANS. INTERIOR HAS 2-SLIDE OUTS MAKING IT VERY COMFORTABLE. 2 5/15 HIGH-RISE GOOSENECK HITCH, PLUS 30,000 LB. TAG HITCH TO COVER ALL YOUR TOW NEEDS. 100 GALLONS FRESH WATER. GIRARD TANK-LESS HOT WATER HEATER FOR CONSTANT HOT WATER WHEN NEEDED. 12.5 ONAN QUIET GENERATOR. BACK UP CAMERA WITH MONITOR. IN-MOTION SATELLITE DISH. 43" FLAT SCREEN TV AND MORE. THIS IS THE ONLY TOTERHOME LIKE THIS ON THE MARKET TODAY. CAPITOL RENEGADE IS RECOGNIZED AS THE NUMBER 1 TOTER HOME DEALER BY THE FACTORY. BETWEEN NEW AND USED TOTERHOMES - WE HAVE YOU COVERED!